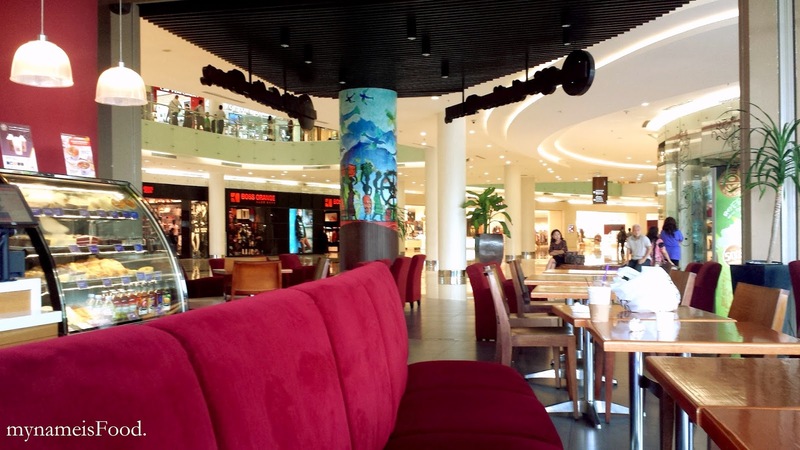 The Coffee Bean & Tea Leaf, Ciputra World, Surabaya, Indonesia - my name is Food. 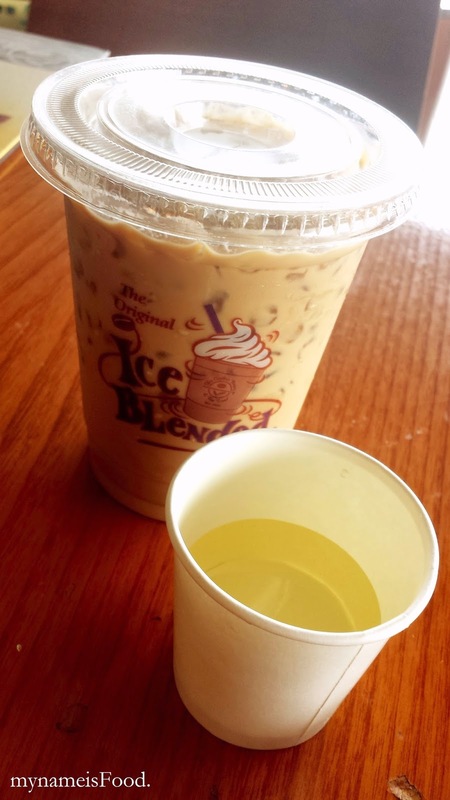 'The Coffee Bean & Tea Leaf', an American coffee chain that started back in 1963 and has evolved till now to being the largest and oldest privately held coffee and tea chain in the US.. Using only the top 1% of Arabica Beans, roasted at a specific degree to develop that richness on its final taste, may it be light or medium roasted. Their tea comes from lush tea plantations in Sri Lanka, China, Kenya, Japan and others.. Their branch has grown so much, in South East Asia too being one of the competitors in coffee chains along with Starbucks Coffee etc. Bought 2 Ice Blended drinks, 'Iced Cafe Latte' (IDR38 = AUD$3.8) with no cream and sugar seperated, and the 'Ice Blended Cookies and Cream' (IDR55 = AUD$5.5) with a bit of cream and coffee added too. The Cafe latte was just a usual cafe latte and the fact that the sugar was seperated was because usually they do somehow put so much sugar inside drinks making them too sweet.. 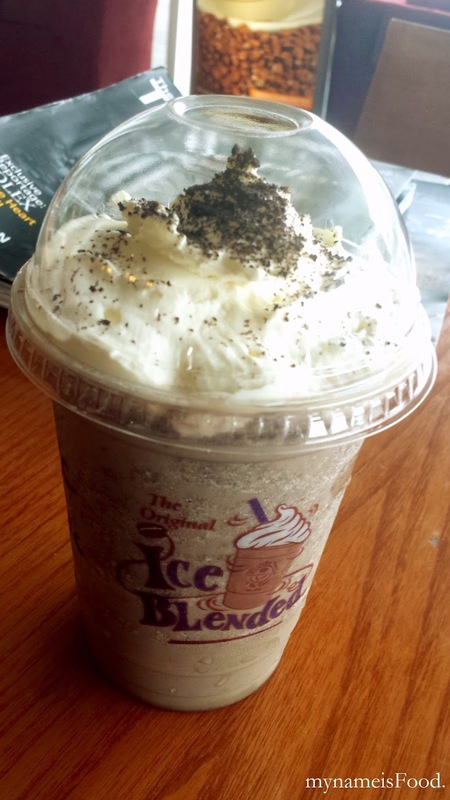 The Ice blended Cookies n Cream was just okay, but it lacked the cookie taste and tasted more cocoa instead of the cookie itself. 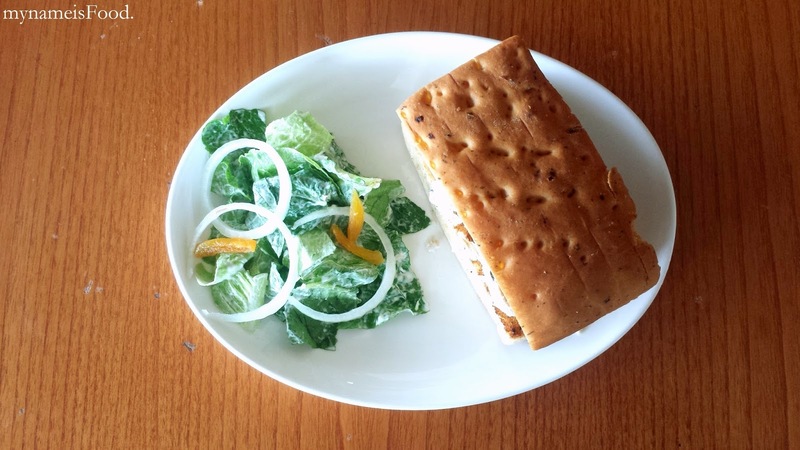 'Caesar Salad' without any meat, additional meat can be added such as chicken or salmon. 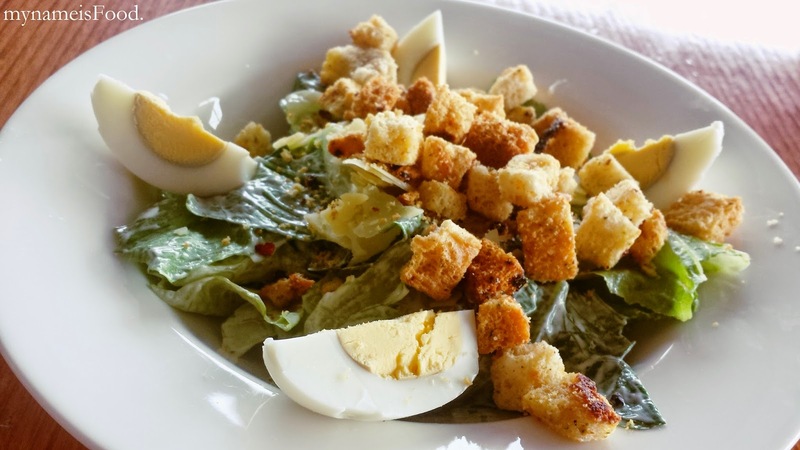 Sometimes, a simple classic caesar salad is nice. 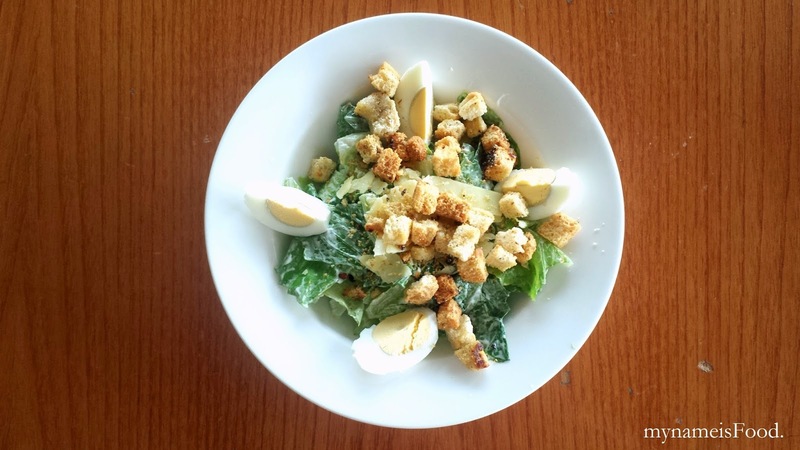 The salad had cos lettuce, shaved Aviago cheese, simple bacon bits, croutons and egg. Croutons was okay, but lack of flavour, just seemed like they sliced a slice of toast, the egg was just egg. The bacon bits was a nice addition, sauce was okay, just enough and didn't make you feel like you were needing more sauce for your salad. 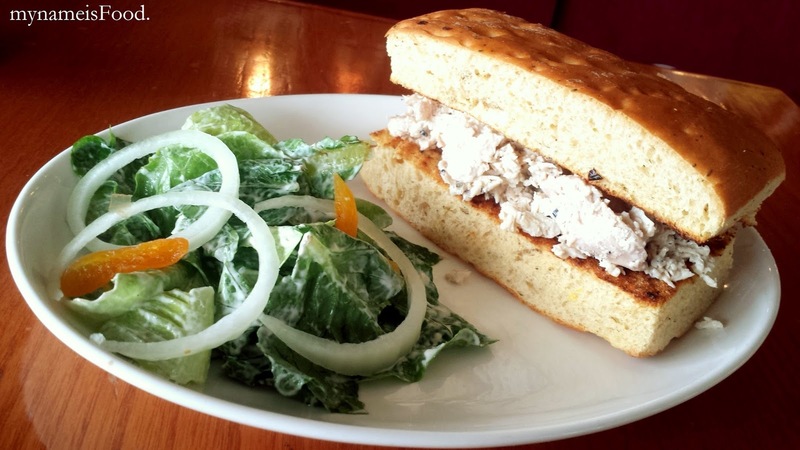 'Chipotle Roast Chicken sandwich' (no price, forgot how much it was.. :( ) was a simple sandwich consisting of roast chicken with pepper and cucumber served with a simple cos lettuce and onion salad. The thick bread seemed like those corn breads but you can't really taste the corn much. Chicken is cheaper than beef here, whilst beef is cheaper over in Aus, so the Chicken sandwiches and other chicken dishes were usually cheaper than the beef dishes or even the fish. The whole meal was served cold, which I'm not sure if that was suppose to be the case or not.. 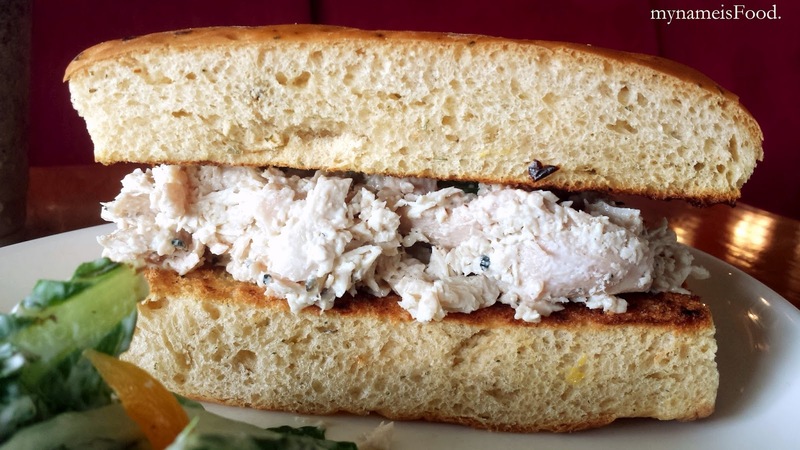 I guess it kind of gives you this fresh feeling, but then at the same time, the bread could have been warmed up a bit which will allow the balance with the cold chicken filling. 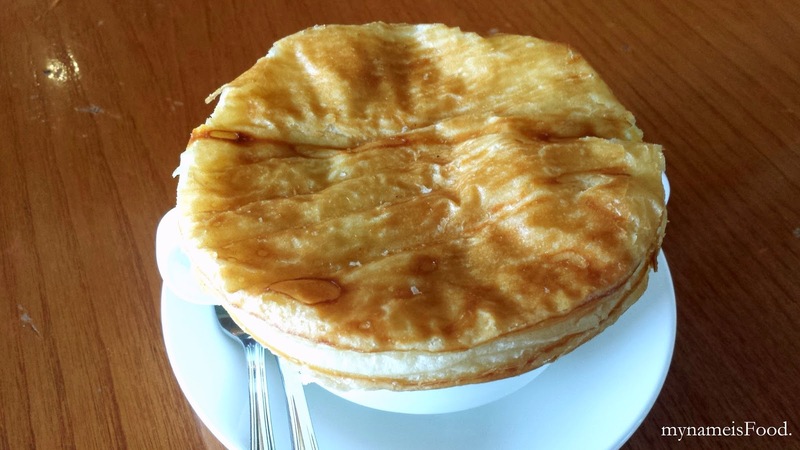 It was quite a filling dish which you could probably share between two people if you aren't very hungry at the time. 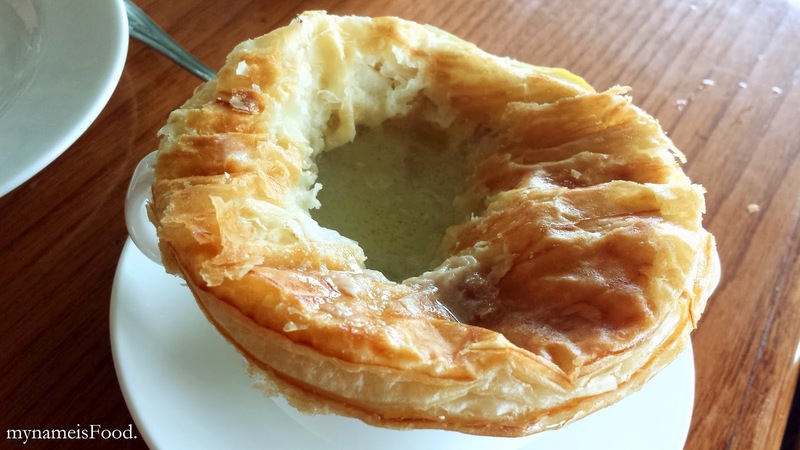 'Chicken Mushroom Cream Soup' (IDR35 = AUD$3.5) consists of chicken breast and mushroom soup with puff pastry. The creamy chicken mushroom soup was quite nicely cooked, though I found that the soup may need more cream in it but overall, chunks of chicken breast and sliced mushrooms was in it. The puff pastry was the only let down for me here, since it seemed that they might have had them pre-packaged, so allowing them to just microwaving the puff pastry, making the pastry not crispy but easily soggy and you can't exactly bite on to them and taste the puffiness of the pastry nor its crispiness. It was just I guess rubbery in a way since you can imagine when you buy frozen pastry and froze them for a while and heating them up in a microwave, just basically ruins it. 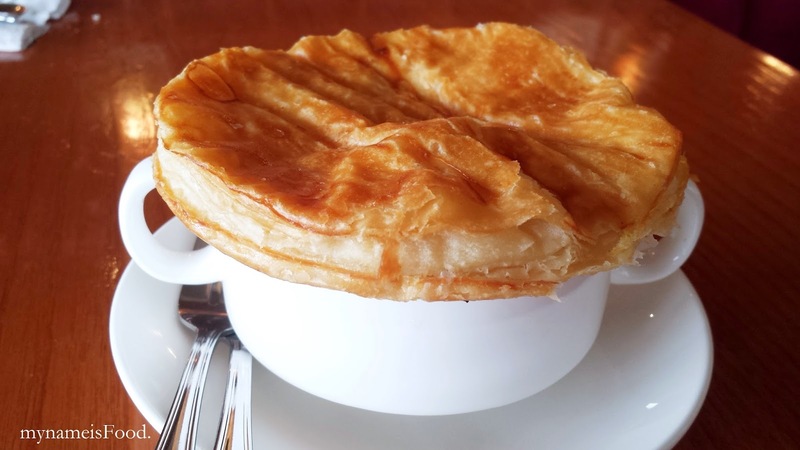 I think they could have done an alternative way in serving the puff pastry for this dish. 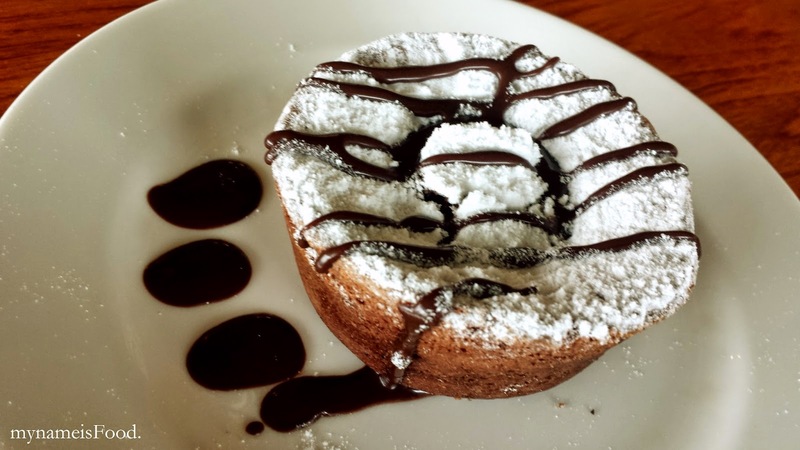 To finish off, we ordered a 'Warm chocolate muffin' (IDR37 = AUD$3.7) which you can consider some sort of souffle, though I'm not too sure why they would post it as a muffin.. Anyways, this was surprisingly quite nice. 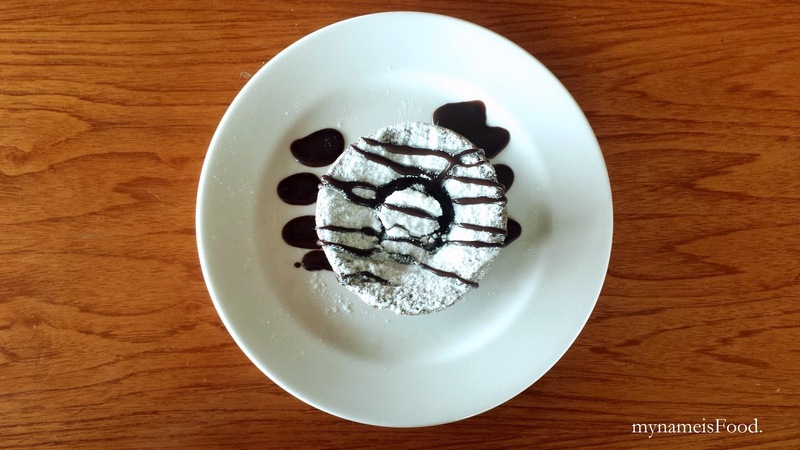 Presentation of the chocolate muffin had icing sugar dusted on top and chocolate fudge sauce drizzled on top. Once you open or slice a part of the muffin, warm melted chocolate starts oozing out.. 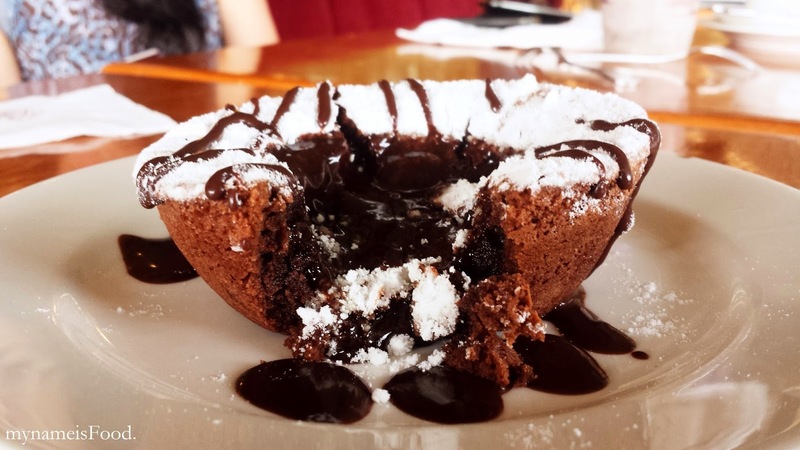 I found this to be quite a perfect chocolate souffle (well, muffin..?) though not placed in a hot stone or an individual pot on a plate, but it turned out yummy. The amount of chocolate was enough and the balance with the muffin balanced out well along with the icing sugar.